A mindful walking practice can bring you closer to your body and nature. Here are 6 tips to get you started on your journey. Mindful walking is an active form of meditation that brings you closer to your body and nature while strengthening your concentration and connecting you to the present moment. 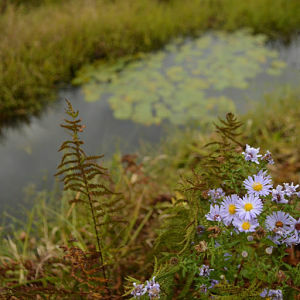 This fall a series of mindfulness walks were led on local conservation properties in and around Wareham. Participants were welcomed by me and guided by Jessica Webb, director of Anchor Yoga and Mediation in Mattapoisett. The successful three-part series focused on simply enjoying the peace and beauty of nature through guided, mindful meditation while walking on the trails. Here are a few simple guidelines we followed on each walk. Try adopting these practices on your next hike through the woods or stroll around the block and enjoy the benefits. Consider leaving your phone and camera at home or in the car when you set out on a mindfulness walk. Not having these devices on hand eliminates the distraction of a ringing phone and the urge to send a text or snap a photo. Embrace the opportunity to disconnect with technology and reconnect with yourself. Gently clasp your hands in front of your belly or behind your back. Keeping your hands near the center of your body will create balance and keep your swinging arms from being a distraction. Set aside plenty of time for your walk or only walk a short distance so you won’t feel rushed. Walking at a slow pace is an expression of patience with yourself and will allow you to appreciate all the little movements involved in taking each step. Notice the shift in weight as you move from the heel to the ball of your foot. Recognize the muscles that work to lift your leg and stretch it out in front of you. Notice the air that moves in and out of your lungs. Feel your lungs expand with each inhalation and contract with each exhalation. Appreciate this easy, automatic function and discover ways you can make your breath deeper and more intentional. Use your senses to notice the scent and quality of the air. If you’re walking with a partner or a group, agree to not speak unless necessary. Eliminating the opportunity to chat will allow for more inward exploration. Notice your thoughts, recognize the urge to talk, acknowledge the temptation to point out something around you, and let those thoughts drift by. If your mind begins to wander, bring it back to noticing the sensation of your feet touching the ground. Notice the striking details in your surroundings. Make a frame with your forefingers and thumbs and choose an area about that big to focus on. Dissect all the components that make up that tiny section of existence. Appreciate the intricacies of what you see. Then, pan out and soak in the breadth of your surroundings; look up, down, behind, and to your sides. Practice this exercise at different points that interest you along your walk. Notice your shift in energy or mood after a mindfulness walk. 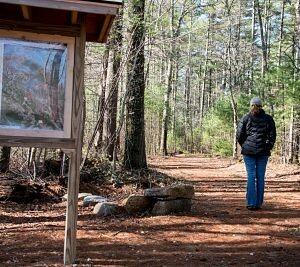 If you enjoy this practice, or would like to experience it with a group, register for our winter Mindfulness Walks at The Bogs in Mattapoisett on January 28 and Great Neck Wildlife Sanctuary on February 25. These events are free and open to participants of all ages. We hope to see you there!